The Annual Digifest will be held on the first full weekend of June (2012 dates are June 2nd and 3rd ). This will be Digifest’s 5th year. Its popularity is growing with more than 200 logs received last year. 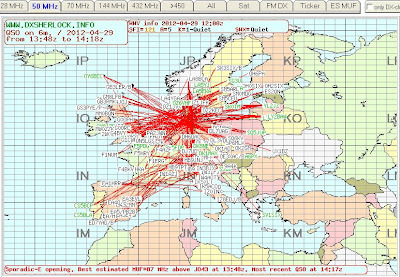 A peculiarity of this Contest is the great variety of different categories of participants in five digital modes: RTTY 75, BPSK 63, MFSK 16, HELLSCHREIBERand OLIVIA. The points calculation is based on the distance between the stations. The contest consists of 3 convenient periods (8 hours each) during the weekend. To add more excitement those who like competing in real time will be able to see their results on a server. There are lots of nice prizes, mostly RigExpert AA-230 and AA-30 Antenna Analyzers and RigExpert USB Interfaces. All prizes sponsored by RigExpert Ukraine Ltd.
As the number of the participants is relatively small and the most populated competing area is Europe, stations from NA, SA, Africa, Asia and Australia are at a great advantage. Last year those stations were the most prize winners. To support growing participation from Europe the sponsors have doubled the prizes so separate main prizes are now offered both for Europe and the rest of the world. For those won’t be able to win a main prize there will be a lot of small gifts like T-shirts and paper awards. All the prizes will be mailed to participants' home addresses. The results are usually available just 2 weeks after the end of the Contest, So, lets meet on the first weekend of June and have fun! 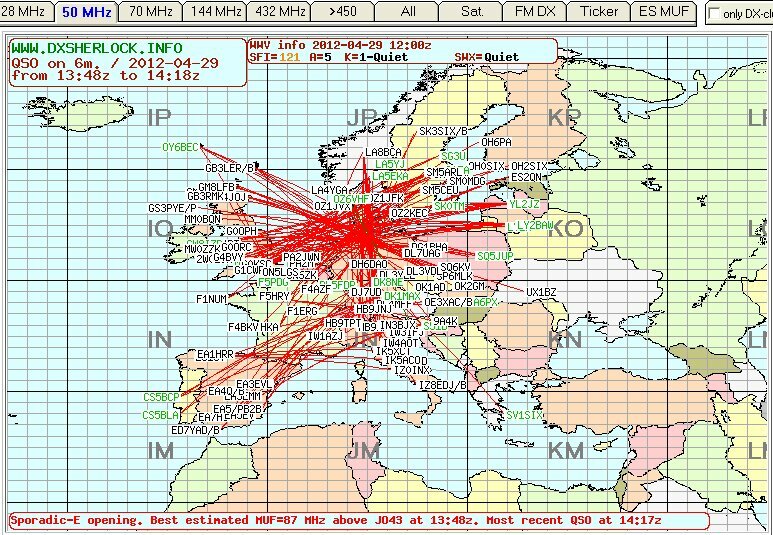 A DX Sherlock VHF propagation alert popped into my mailbox this afternoon to warn me about a possible Sporadic-E opening on 6 metres. My K3 was WSPRing on 10m at the time and when I went to look several new stations had been spotted indicating the presence of short skip propagation. 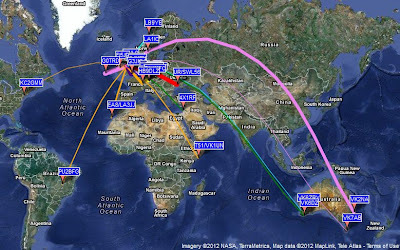 I switched to 6m but very few WSPR stations were active and no spots were made or received. 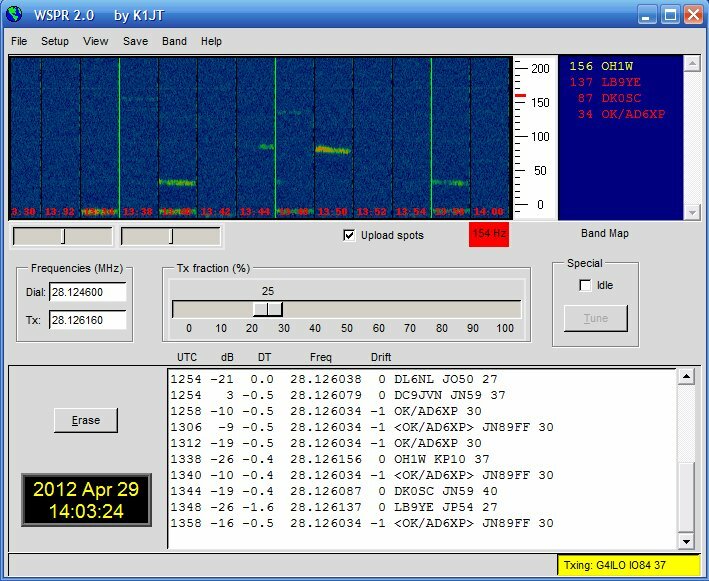 I tuned the receiver and heard a weak Polish station on SSB but the opening was over and no contacts were made. Still, it is good to see some activity on the "magic band." Things can only get better! Ebay is a good place to buy accessories like speaker/mics and headsets for your radios. A few years ago I used it to buy a speaker/mic for my Kenwood TH-F7E. After I sold that radio I used the speaker/mic with my TH-D72. When I tried it with my old TH-205E however I found that PTT didn't work. I soon established that the reason was the genuine Kenwood accessories used a monophonic 2.5mm plug with only two contacts, tip and sleeve, for mic audio and PTT. The third-party accessories from eBay used a stereo 2.5mm plug with tip, ring and sleeve, but there was no connection to the ring. It looked as if the plug in the radio was trying to make contact in the area of the ring. This obviously was OK for newer Kenwood radios but with the 205E there was no ground connection for the PTT. My first thought was to open up the speaker mic, find the wire connected to the ring and connect it to ground. However I soon found that the cable of my speaker/mic had no wire connected to the ring at all. My only option was to try to bridge the two contacts together using solder. This I did, and the speaker/mic then worked with the TH-205E. The Wouxun KG-699E and the Baofeng UV-3R+ also claim to use accessories with a Kenwood-compatible plug but just like the 205E I found that PTT did not work. I have just performed the same modification to the plugs on a "Kenwood-compatible" headset/boom mic and also one of the earpiece/mics that came with the Baofeng and Wouxun so that they would all work with all four radios. 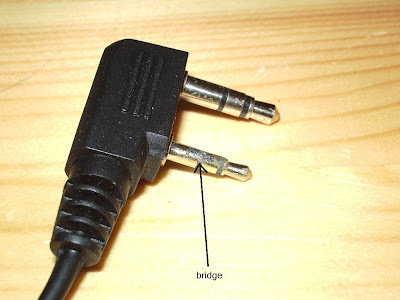 It is easy to do, but you need to take care as it's easy to melt the plastic parts of the plug and you could easily ruin it if too much heat is used. Using a sharp craft knife cut away a small section of the black plastic insulation between the ring and the sleeve of the 2.5mm plug to reveal an inner metal sleeve. Open this up a bit more using the edge of a jeweller's file. Then make a solder bridge between the ring and sleeve. You need to apply heat using the edge of the soldering iron bit to the inner sleeve in order that the solder will bridge the gap. Apply the soldering iron for as short a time as possible to avoid melting the plastic insulation and destroying the plug. I used Blu-Tac to hold the plug in a steady position whilst soldering. After you have bridged the contacts use a jeweller's file to remove any excess solder from the plug. You should also smooth the plastic insulation between the plug contacts which may have melted and bulged a bit. The plug should be completely smooth between the contacts, the solder bridge and the insulation. It should plug easily into the socket on the radio. If it needs a firm push then try a bit more filing until it goes in easily. You don't want the plug to get stuck in the radio nor for it to damage the socket contacts if force is needed to insert or remove it. I accept no responsibility for damaged plugs or radios as a result of trying this modification. However I have done three of them now with success each time so it is possible with care. Now my "Kenwood-compatible" accessories will work with old and new Kenwoods as well as the Baofeng and the Wouxun. 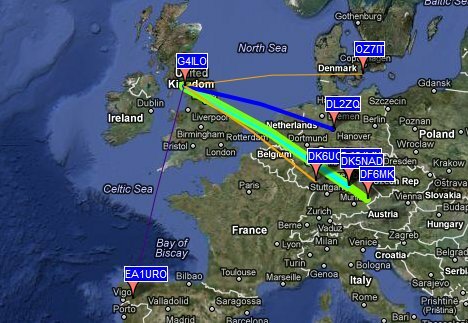 A different picture of 10m propagation than a week ago. The band was dead for most of the morning. Then I started to receive and be spotted by German stations at around 1200km distance - weak Sporadic-E I think. Someone asked me whether these WSPR spots were obtained using the Propeller beacon I have been writing about. I'm afraid not. I haven't managed to solve the frequency stability problems of my Gadget Gangster board so I've been using my K3 for transmit and receive. Yesterday the Medion computer speakers that I used with my Elecraft K3, failed. I was WSPRing on 10m and had the speakers switched off at the time but I saw some unusual interference on the waterfall and switched them on to listen. Nothing happened. No audio, nor did the blue power LED light up. I checked the obvious things such as the cables and that the power supply was delivering 14V DC. It was. I took the speaker containing the audio amp over to the workbench and tried it on the bench power supply. Although the speaker was behaving as if no power was being applied, 20mA was being consumed when the switch was on. I have no idea where it was going. Without a schematic there isn't much I can do but I doubt that the speakers are repairable anyway. There are no active components on the circuit board apart from one integrated module attached to a small aluminium heatsink. This has presumably let its smoke out. There are a number of capacitors on the board and the cable connections are extremely well filtered against RFI. I have never seen such attention paid to preventing RFI. I guess that this is because Medion is a German company and Germany seems to be the only country that takes compliance with EMC standards seriously. The speakers were almost completely immune even when I ran 100W. Having a tone control they produced very rich-sounding audio from the K3, unlike its internal speaker which is shrill to listen to and has very little bass response. I've now replaced the Medions with a pair of passive speakers that I originally got for this task but with those the audio sounds boxy no matter how I fiddle with the K3's RX EQ settings. The only benefit of them is that I'm using one less wall wart! These Genius speakers look like they might be a good replacement but ordering a pair would be a lottery as I have no way of knowing if they are RF-proof enough. One pair of Logitech speakers I bought were a dead loss. They were handed to the local Oxfam shop within an hour of the postman delivering them as they were so sensitive to RF they were beyond hope. A couple of days ago I decided to take another look at the Spectrum Communications Off-Air Frequency Standard (OAFS). It had been suggested that its failure to work might be the result of a solder bridge or similar error. I had a good look at the board using a high power magnifier and found a pair of pads that were suspiciously linked to ground. A moment's work with the desoldering braid and sure enough there was a solder bridge exactly the width of a PCB track. Having found a fault I was optimistic that the board would work. The setup adjustments were completed OK. But instead of hearing BBC Radio 4 in the speaker as the instruction sheet suggested I received a loud heterodyne with some speech faintly in the background, like listening to an AM signal in SSB mode with the BFO a couple of kHz off-tune. I was looking at the Spectrum Communications advert in Practical Wireless to check how the ferrite rod was mounted and noticed that the description said "Background heterodyne whistle at 2kHz confirms lock condition." That is exactly what I was getting. Odd that the instructions didn't mention it though. Nevertheless I gave a cheer and went ahead with installing the board in its box. My happiness was short-lived when I put my frequency counter on the output. It was 10MHz sure enough, but it was not phase locked to anything. I was only receiving the output of the uncontrolled 10MHz crystal oscillator which could be tuned a few tens of Hz either side of 10.000MHz. No adjustment I could make would cause lock to occur. Comments made to my original post about this suggested that I might have problems with the OAFS as I am not in a good location to receive a strong signal from BBC Radio 4. I'm unhappy with the amount of time I've wasted on this. I think it would be best to write it off and forget about it. I'd rather not be bugged by it or have it taking up scarce space in the G4ILO shack. If anyone would like to have it and see if they can make it work then it's yours for the cost of the postage. A package from China arrived in the post this morning - a USB programming cable for the Baofeng UV-3R+. I got it from eBay seller happyhamshop where it was sold as a "USB programming cable for Wouxun handheld radio" but Baofeng claims that the UV-3R+ is compatible with Wouxun accessories. I was going to make my own cable but I didn't have a 2.5mm stereo jack plug in my parts box so I decided to take the easy option and get a ready made cable for not much more than the cost of the plug from a components vendor. The cable was detected and appeared as COM1 - the same com port number as my other USB to serial adapters that use the Prolific chipset. I haven't tried it on the Wouxun - I can't think of a reason to program channels on 4m - but it works with the Baofeng using both the manufacturer's software and CHIRP, the platform and rig-independent memory management program. It took me several attempts to transfer the memories from the old UV-3R to the new one. Writing a file taken from the old radio to the new one using either program caused the frequency display to read DDDD.25. Fortunately I knew enough about this issue to have used the software to make a backup of the factory configuration, which was easily restored. The solution, if you're interested, was to use CHIRP to export the memories from a file saved from the old radio to a rig-independent .chirp file, then load the factory configuration from the radio and import the file you just exported. Problems with programming cables seem to be making up half the traffic in forums and groups dedicated to handheld radios. The problems are all associated with cables that use (or claim to use) Prolific USB adapters. These days, programming cables come with USB adapters built-in, so the need for separate USB to RS-232 converters - which could use a less troublesome FTDI or Silicon Labs chipset - is eliminated. But so, unfortunately, is the option to solve the problem by using a different type of adapter. A couple of days ago I became aware of something that is certainly not going to make this issue any less common. Apparently a Chinese chip manufacturer has produced an unlicensed clone of the Prolific PL2303 USB to serial chip which is now being used in many of the USB cables that come from China. Prolific is understandably not very happy about this. It has released a new driver that detects the clone chip and fails with an error code 10, causing much frustration for the innocent end user. The solution, apparently, is to turn off automatic updating and install an older driver (the cable vendor will hopefully have a link to a driver that works with the cable they sold you.) The problem seems to be worst for users of 64-bit Windows 7 for which there are fewer old drivers in circulation. I deliberately stay as far from the bleeding edge as possible, and have automatic updates disabled on my shack PC. So far I have had no problems with the 32-bit Windows XP Prolific driver I've been using for the last couple of years.